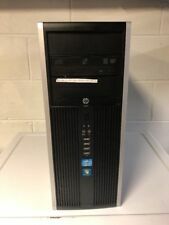 HP 8300 Elite Convertible MiniTower. Windows 10 Pro v1803 with latest updates. DVD-RW with Lightscribe. Dell OEM Installation CDs Included - Dell UltraSharp 1708 LCD Monitor. Genuine Microsoft Windows software preinstalled. - 1 Rear Audio Line In Jack. - 1 Rear Audio Line Out Jack. - USB Mouse. Don't be fooled by Original Manufacturer (ex. ). 250GB SATA Hard Drive installed with Windows 10 HP 64. - Dell OEM Installation CDs Included - Dell 17" Monitor. Genuine Microsoft Windows software preinstalled. o Windows 10 Homr Premium 64bit. Don't be fooled by Original Manufacturer (ex. ). 120gb Solid State Drive installed with Windows 10 hp 64. - Dell OEM Installation CDs Included - Dell UltraSharp 1708 LCD Monitor. o Windows 10 hp 64bit. Genuine Microsoft Windows software preinstalled. Genuine Microsoft Windows software preinstalled. Don't be fooled by Original Manufacturer (ex. Dell) disks. with the ORIGINAL COA. If not, it's very possible that is an illegitimate load of Windows which WILL leave you exposed. Dell OEM Installation CDs Included Genuine Microsoft Windows software preinstalled. Don't be fooled by Original Manufacturer (ex. Dell) disks. with the ORIGINAL COA. If not, it's very possible that is an illegitimate load of Windows which WILL leave you exposed. Dell 19" LCD Monitor. - Dell OEM Installation CDs Included Genuine Microsoft Windows software preinstalled. Don't be fooled by Original Manufacturer (ex. Dell) disks. We professionally refurbish computers to Microsoft's strict standards. Dell OEM Installation CDs Included o Windows 10 hp 64bit. Genuine Microsoft Windows software preinstalled. - 1 Rear Audio Line In Jack. - 1 Rear Audio Line Out Jack. - USB Mouse. Don't be fooled by Original Manufacturer (ex. ). 500GB SATA Hard Drive installed with Windows hp 64. - Dell OEM Installation CDs Included - 1 Rear VGA Port. - 1 Rear DisplayPort Port. - 1 Rear COM Port. Windows 10 hp 64bit. Don't be fooled by Original Manufacturer (ex. ). 1TB SATA Hard Drive installed with Windows 10 hp 64. - Dell 19" LCD Monitor. - Dell OEM Installation CDs Included o Windows 10 hp 64bit. Genuine Microsoft Windows software preinstalled. - 1 Rear Audio Line In Jack. Dell 17" LCD Monitor. - Dell OEM Installation CDs Included Genuine Microsoft Windows software preinstalled. Don't be fooled by Original Manufacturer (ex. Dell) disks. We professionally refurbish computers to Microsoft's strict standards. Customize Your Own Desktop PC! Fast Fast Shipping! 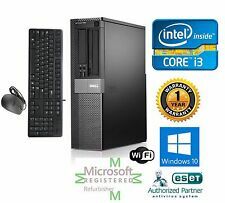 Fast Dell Optiplex SFF Desktop Computer Tower PC Core i3 with 1 Year Warranty! Customize Your Own! Excellent Condition! Free Shipping! Excellent Condition! Ships Fast! Full 1 Year Warranty! Full 1 Year Warranty! Excellent Condition! Fast Ship! Limit 2 Per Customer! Full 1 Year Warranty! 250GB Hard Drive. 4GB RAM DDR3 Ram. Hard Drive Specifications of the machine are as follows Optical Drive Other Details 4" x 13.3" x 14.9" (H x W X D). Pre-installed OS-Windows. Fast Core i3 Computer! Fast Shipping! Fast Core i3 Processor! Ships Fast! Dell OptiPlex 990 Desktop SFF Core i3 @ 3.30GHz 4GB memory 500GB hard drive Windows 7 Home Premium. This is a surplus item from our local college and is in 100% working order. Windows has been loaded but not updated to latest service pack etc. Drivers are included. Model: OptiPlex 790. Hard Drive Capacity: NONE. All Completed With No Errors or Issues. Outer Casing - Good physical condition with scuff marks, sticker residue and scratches. Power Cord: Not Included. Excellent working condition with windows 7and Microsoft office 2016 installed a 250gb hard drive 4gb ram. Any tampering with this product will void its warranty. Model Dell Optiplex 390 DT. Storage 180 GB Solid State Drive. Check the item specs above for specific warranty details. Printed manuals are not available, but most manufacturers have electronic versions available for download. We do not provide technical support for set up, installation or any other use related issues. Therefore, we do not have record of item history or type of use. Dell UltraSharp 1708 LCD Monitor. Genuine Microsoft Windows software preinstalled. Don't be fooled by Original Manufacturer (ex. Dell) disks. with the ORIGINAL COA. If not, it's very possible that is an illegitimate load of Windows which WILL leave you exposed. Dell OEM Installation CDs Included - Dell UltraSharp 1708 LCD Monitor. Genuine Microsoft Windows software preinstalled. - 1 Rear Audio Line In Jack. - 1 Rear Audio Line Out Jack. - USB Mouse. We professionally refurbish computers to Microsoft's strict standards. 240GB SATA "NEW" Solid State Drive installed with Windows 10 hp 64. - Dell OEM Installation CDs Included o Windows 10 hp 64bit. Genuine Microsoft Windows software preinstalled. - 1 Rear Audio Line In Jack. Dell UltraSharp 1708 LCD Monitor. Genuine Microsoft Windows software preinstalled. - 1 Rear Audio Line In Jack. - 1 Rear Audio Line Out Jack. - USB Mouse. Don't be fooled by Original Manufacturer (ex. ). Dell UltraSharp 1708 LCD Monitor. Genuine Microsoft Windows software preinstalled. Don't be fooled by Original Manufacturer (ex. Dell) disks. We professionally refurbish computers to Microsoft's strict standards.